– This city hates reservations and all of the best spots are popular, so be ready for waits unless you eat early. Like seriously, forty five minutes to an hour is typical. – Enjoy the Seafood. The seafood here is excellent: super fresh and local. However, their sushi felt a bit overpriced and underwhelming. Stick to seafood dishes that plays to Vancouver’s assets: snow crab salads, fresh oysters, gorgeous filets perfectly cooked. The chefs’ technique always felt modern and crisp, the perfect canvas to enjoy fresh flavors against. 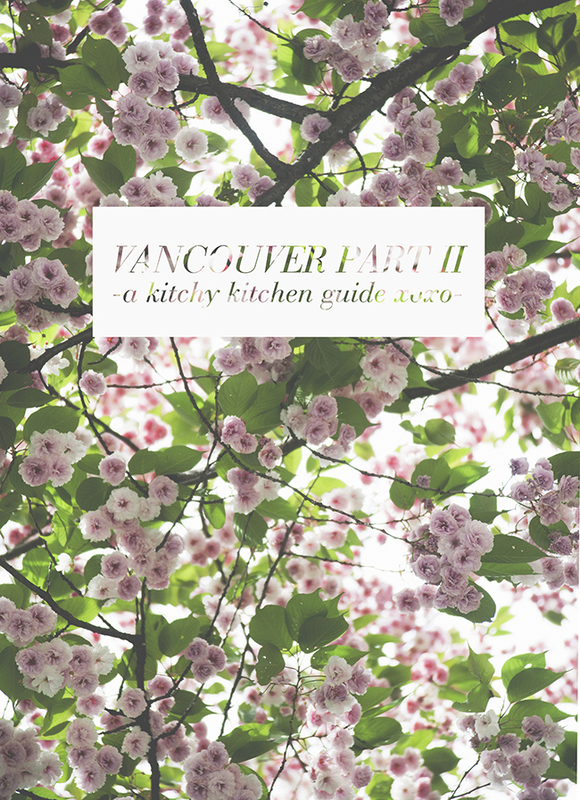 – Vancouver is a dinner/coffee city the way LA is a brunch/lunch town. The city seems to come alive in the evenings when everyone comes out. – See More. 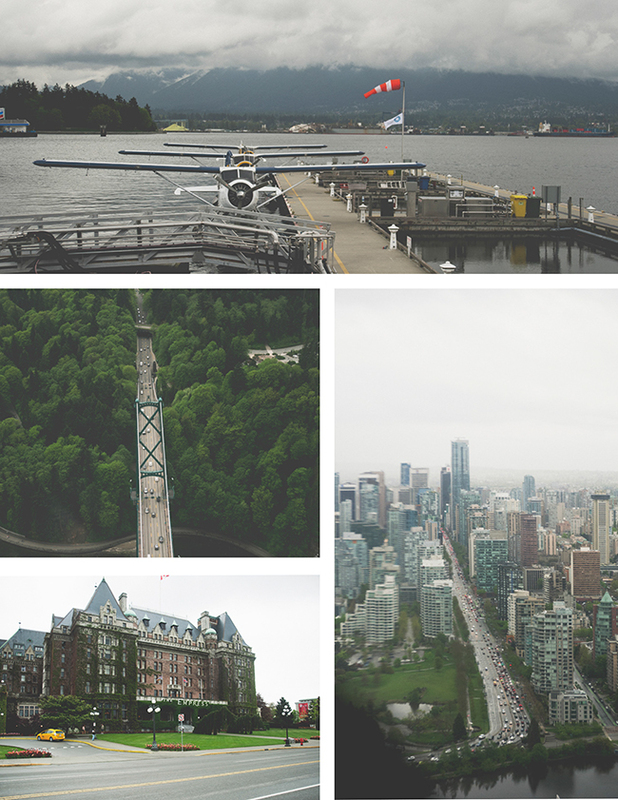 Vancouver is a fantastic base of operations to see some of the most beautiful landscapes in the regions. 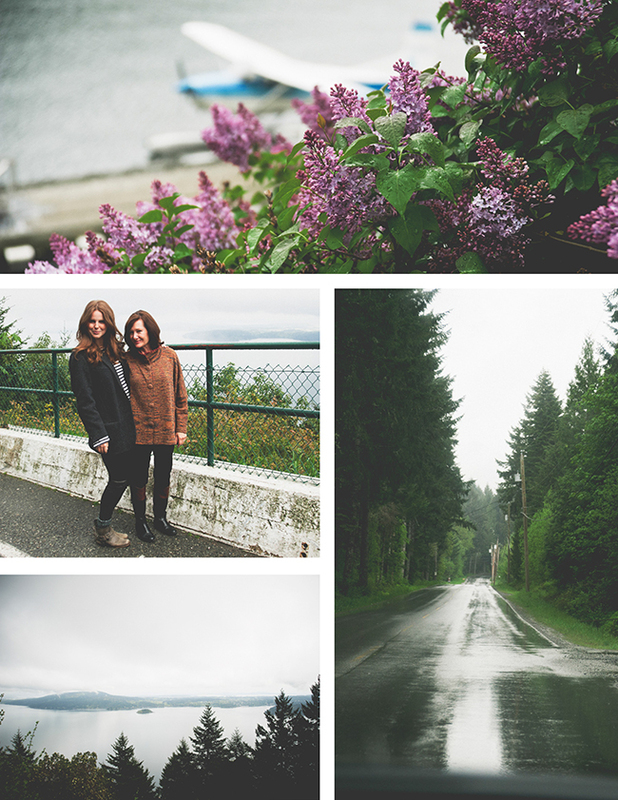 Book a day trip to Victoria (more on that later), go for a run or bike ride through Stanley Park, or head across the bay to enjoy some antiquing and delicious pie (Savary Island is one of the best!). – Visit in spring or summer, when the flowers are in bloom. I was here in May, when the city was awash in pink. It looked like a cotton candy factory exploded and coated everything in fluffy, saccharine tufts of the stuff. It was so so pretty. – An umbrella, because “d’uh.” It’s wet ALL THE TIME. Even in the middle of the summer, you’ll get random showers, which is why this city is to electrically green and sparkling clear on a sunny day. – Cab Fare. Vancouver is not what I would describe as a walking town. Some neighborhoods are close enough to walk to each other, but the cool bits are surprisingly far apart. Be prepared to walk a couple miles, or just bite the bullet and call a cab. – Sunglasses. I have never felt more hungover while sober than in Vancouver. The light there is so clean and bright, that I found myself hissing like a vampire when I would go outside. It’s gorgeous, but requires a pair of sunnies in case the sun comes out. – Layers. The weather can go from warm to wet in minutes, so keep a light jacket or sweater handy when you’re out and about. – Skinny Jeans. You want to fit in, right? 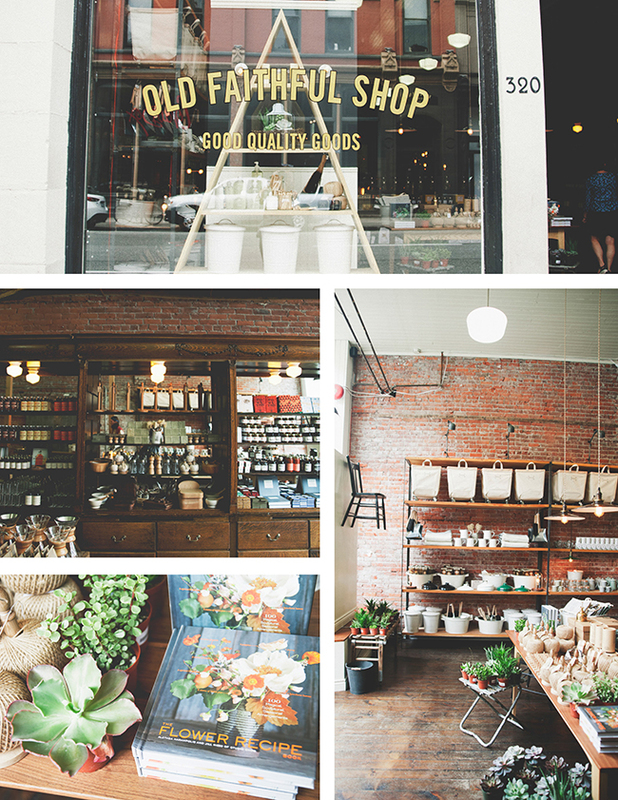 The vibe in Vancouver, similarly to Toronto, is multicultural and very casual. Women keep hair and make up low key or barely there and men are rocking desert boots or chucks. Everyone else is ready for a hike. So keep your heels stashed at home! – An appetite. The food is very very good here. Imagine Shutter Island for the bourgeois. Fancy cheese replaces the criminally insane…and you can come and go as you please…by a rainbow aqua bus. Super apt analogy. 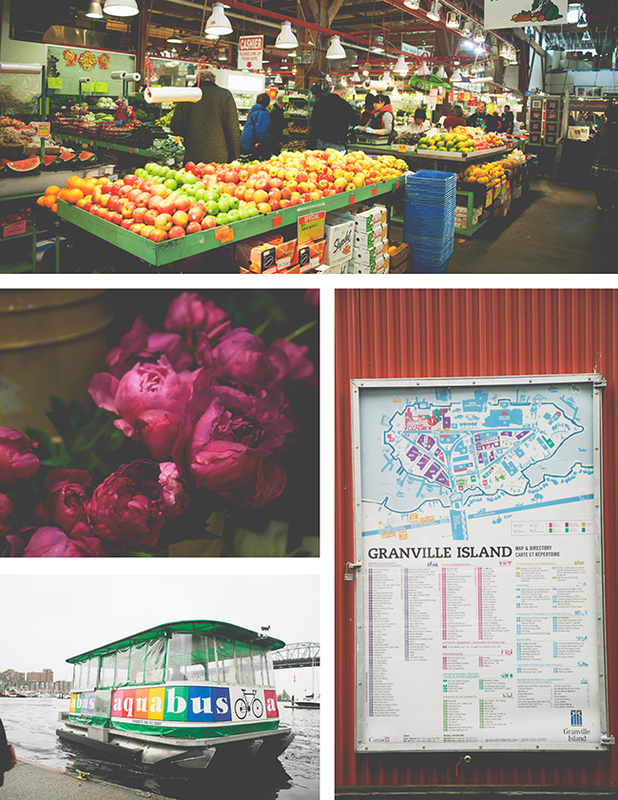 Granville Market is located on a tiny island in the middle of the city. It has a covered food court with a very large proportion of Italian meats and cheeses, plus some fun local shops, distilleries, and children’s stores. The flower mart was my favorite, along with the Asian produce stands which had fresh fruit I’ve never seen available in LA before (mangosteens and the like). Fun, colorful, and bright, Parliament Interiors has a Jonathan Adler vibe without feeling too locked in to a mid-century aesthetic. 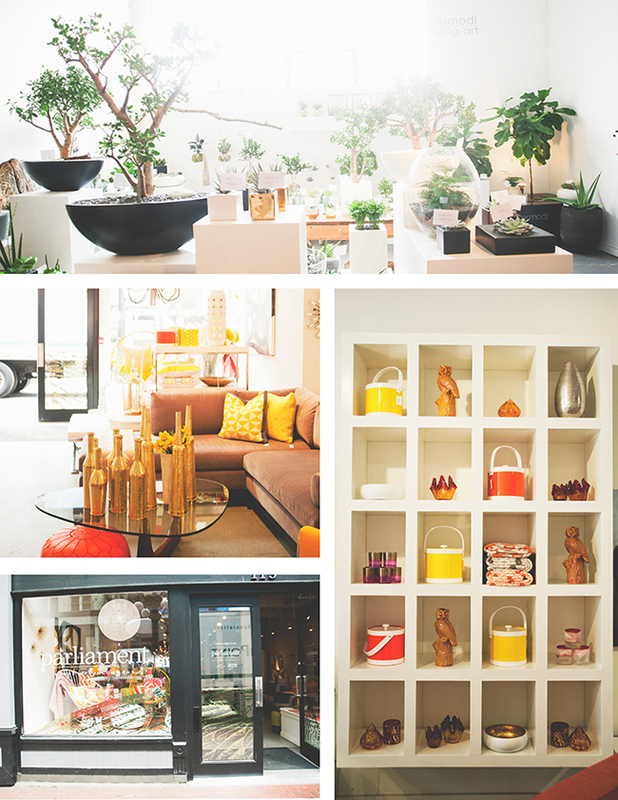 I especially loved their home decor items and lighting – so fun! 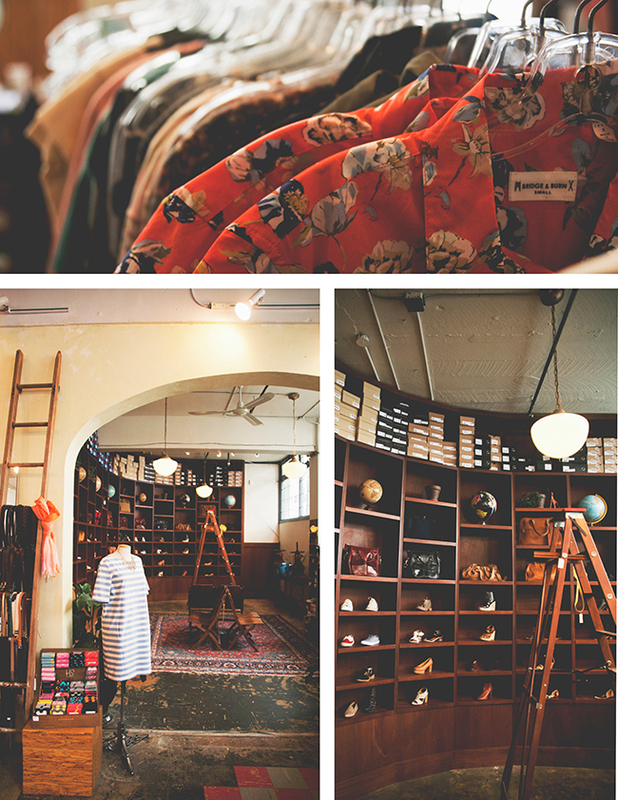 Imagine if Kinfolk magazine had a store. Yep, this is it! 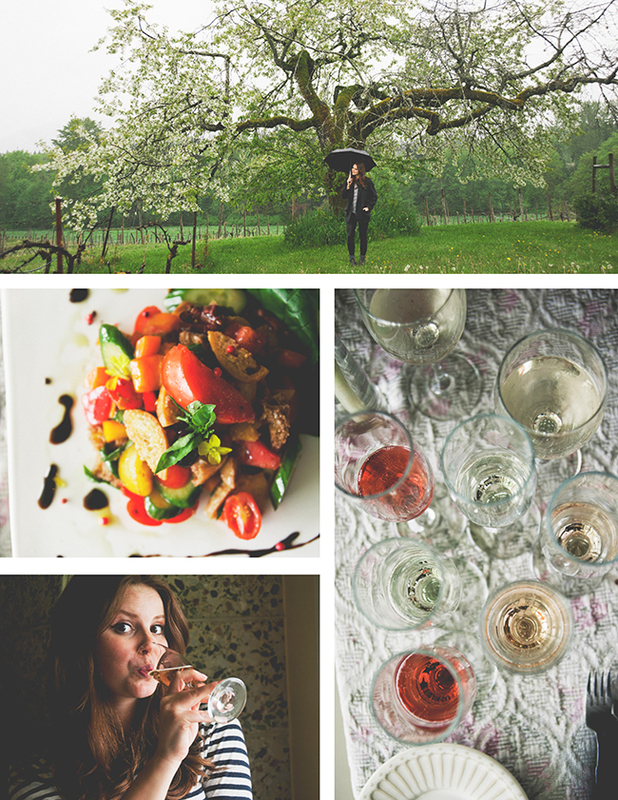 Beautifully curated and tastefully done, you could totally Mrs. Basil E. Frankweiler this place and move in. Home goods, fancy chocolate, things like the perfect canvas bag – you could REALLY do some damage here. If you’re a denim nut this place is for you. Not only to they carry a vast array of boutique denim, they also carry exclusive leather goods too. Are you or someone you love a very stylish dude? Then you will love this place. They carry well loved lines like APC or Givenchy, but a ton of small, lesser known designers as well. Hey sneaker heads! Who needs Jordans? This is Vancouver’s version of Undefeated, carrying an impressive collection of sneakers from all of the major players. If Steven Alan and APC are your jam, you will loooooove The Block. The clothing selection is colorful and fun, with a nice mix of popular labels and some unknown locals. This store is ADORABLE. Moroccan rugs, Pendleton blankets, Riess cookware, basically all of my favorite things under one tiny roof. Plus it’s close to Forty Ninth Parallel, so it’s a fun shopping/coffee one-two punch. Vancouver’s version of Merci in Paris. 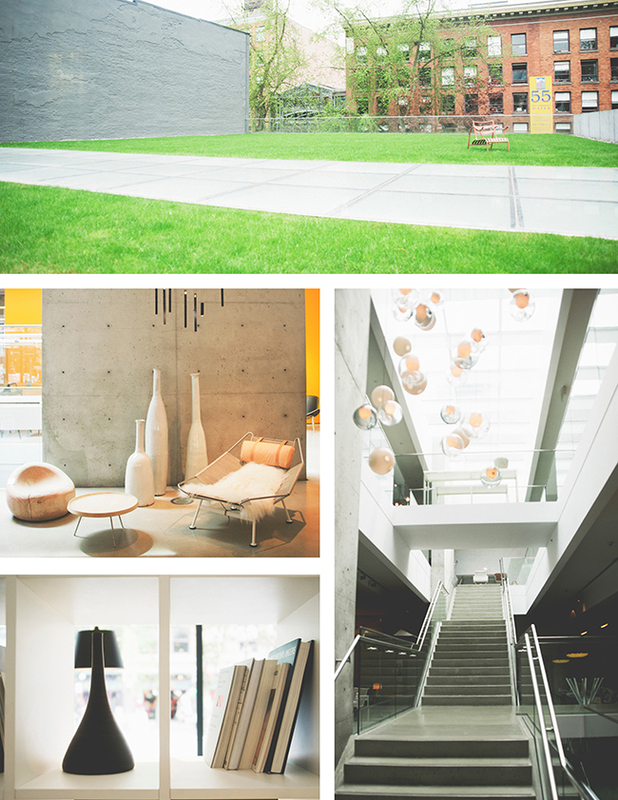 Three stories, the chicest stuff, and all beautifully curated. You could get lost in here for hours if you wanted to. Even if you’re not currently appointing your home with gorgeous Thomas Dixon pendant lamps and Marcel Breuer chairs, it’s a fabulous place to window shop. 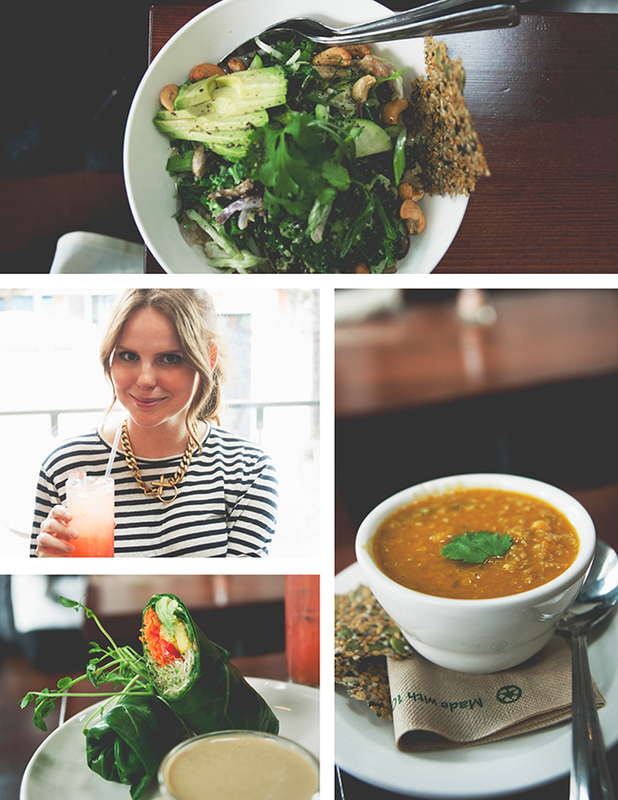 A charming vegetarian restaurant with eclectic and light lunch fare. The sweet and tart strawberry lavender shrub was a refreshing and bright, the mango spring rolls wrapped with collards were delicious, especially with the dipping sauce, but my favorite was the chickpea quinoa roasted onion yam curry coconut milk “soup.” I put quotes around “soup” because it was actually quite thick, almost like a stew or chili, but wow was it good. I want to make a huge batch of it this winter and just live off of that for a week. This tiny winery is located up the island a bit in Duncan, and offers some very nice sparkling wine and a white blend called Damasco that would be fantastic with Thai food. The restaurant is just off the tasting room and looks out on the vineyard, where the eighty-something mother of the owner putted around in her garden. The lunch was delicious. I loved the simple panzanella and the flavorful shrimp sandwich, but of course the highlight was the sparkling wine flight. Spooky and I just sat there, enjoying the rain with a glass of bubbly quietly. Such a lovely way to spend an afternoon. About 4 hours north west of Victoria is Tofino, home to a First Nations Biosphere and some pretty extraordinary natural wonders. The whale watching is supposed to be fantastic, and you can take a First Nations canoe tour through biological landmarks. I adore flowers, so when Spooky told me about this place I swore I needed to go there the next time I visited. Butchart Gardens is essentially one of the best show gardens in the world. Jennie Butchart, who started the garden over one hundred years ago, established the garden on top of the gigantic quarry her husband had dug. Over time, the quarry grew into a beautiful sunken garden. It just grew from there: a Japanese garden, an Italian garden, and a beautiful rose garden now expand the space. One day, Butchart Gardens! A twenty minute drive from Victoria will land you in Gold Stream park, home to hundred of trails and, in the summer, a river so dense with salmon, they’re jumping out of the water. It’s quite a sight. In the summer, the lavender is at its peak, and you can visit the farms. Could you imagine how wonderful that must smell?